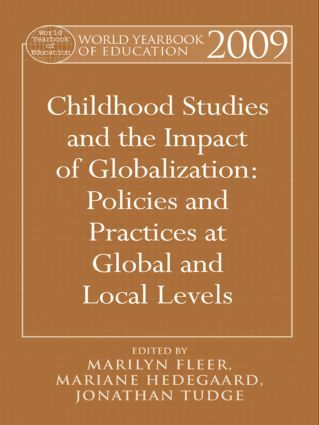 The World Yearbook of Education 2009: Childhood Studies and the Impact of Globalization: Policies and Practices at Global and Local Levels examines the concept of childhood and childhood development and learning from educational, sociological, and psychological perspectives. This contributed volume seeks to explicitly provide a series of windows into the construction of childhood around the world, as a means to conceptualizing and more sharply defining the emerging field of global and local childhood studies. At the global level there has been increasing discontent with how children have been reified and measured. Prevailing Eurocentric and North-American notions of childhood and development across the North-South boundaries show vast differences in how childhood is constructed and how development is theorized. The World Yearbook of Education 2009 volume provides comprehensive research from Asia-Pacific, the Americas, the African region and European communities and is presented with a special focus on education. It examines childhood from birth to twelve years of age, across institutional contexts and within both poor majority and rich minority countries. Cultural-historical theory has been used as the framework for investigating and providing insights into how childhood is theorized, politicized, enacted, and lived across these communities. A range of theoretical orientations informs this book, including cultural-historical theory, ecological theory, and cross-cultural research. Section 3: Draws upon cultural-historical theory and ecological theory and brings together the themes explored throughout the preceding two sections. The World Yearbook of Education 2009 volume seeks to make visible the cultural-historical construction of childhood and development across the north-south regions and scrutinizes the policy imperatives that have maintained the global colonization of families.